The Precor 9.23 Home Series Treadmill is an excellent all around home treadmill with health club quality. The quiet and smooth Precor 9.23 treadmill features a powerful 3.0 hp motor (continuous duty), which can reach speeds up to 12 miles per hour (in increments of 0.5 mph). The treadmill can incline between 0 (flat) to a 15 percent grade. This model is non-folding, which adds to its stability and allows for a higher user weight capacity. 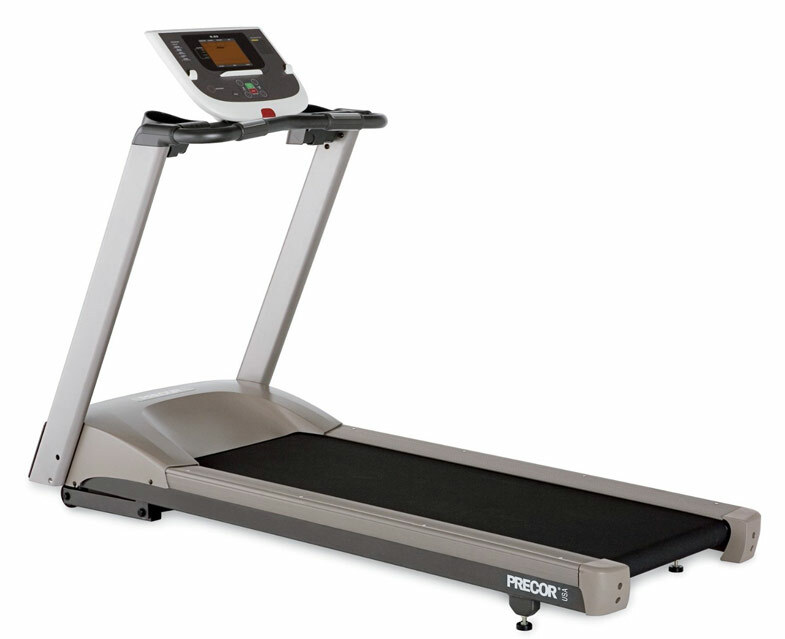 Precor provides a large running deck area of 20″ x 57″ suitable for running, jogging or walking. Ground Effects® Impact Control System. Precor treadmills can adjust for the natural changes in your stride and provide a stable, and low-impact running surface. Multi-zone suspension cushions your joints upon impact. The computer console has an LCD display with 6 workout programs (Fun Run, Hill Climb, Interval, Manual, Walk, Weight Loss). Magnetic safety clip, when detached, immediately turns off power. Touch heart rate monitoring. Smart-Review Commentary: The Precor brand is well known for those that frequent health clubs and gyms. They are known for long term durability which is needed for heavy use. This home series has the same precor quality as the commercial models. With its powerful 3.0 horsepower motor, it is suitable for walking, running, and jogging. This is a non-folding treadmill which adds stability, and has a maximum weight limit of 350 lbs. Precor treadmills feature the Ground Effects® Impact Control System for a smooth running system with minimal impact to your joints. The Precor 9.23 is one of our best rated home treadmills, and has received high praise from both consumers and professionals. This is a Smart-Review Top Pick for a heavy duty treadmill at a reasonable price. It is also Precor’s lowest priced model. Precor’s new 2014-15 Model: Precor TRM 211 Energy Series Home Treadmill (replaces 9.23 model).